Fish don't vote -- is that perhaps why the ocean and its problems are a low priority for governments and few politicians see a need to have a public opinion on ocean-related issues? The ocean and its myriad of problems generally elicit a collective shrug from the general public. You are more likely to see a story detailing the best celebrity beach bodies than something newsworthy concerning the seas. The tide is turning. The ocean is becoming topical. Climate change is becoming a national security issue and focus. President Obama said in his address at West Point: "Next year, I intend to make sure America is out front in putting together a global framework to preserve our planet." Obama also issued a presidential proclamation designating the month of June as National Ocean Month. Secretary Kerry hosted a conference, taking a look at sustainable fisheries, marine pollution, and ocean acidification. Next week, the Global Ocean Commission will release its report and recommendations looking at key threats, challenges, and changes to the ocean in the 21st century. McKinsey will also release an economic study on the ocean simultaneously with that event. Debates are raging daily in the UN as to whether the ocean should be included in the Sustainable Development Goals. Clearly the political and environmental issues around the ocean are becoming impossible to ignore and more central to the debate on climate and security issues. Disputes arising between China, Vietnam, and the Philippines over remote islands under which oil reserves reside threaten fragile ecological systems and escalate global tensions. Fukushima recently released a 'safe' amount of radioactive water into the Pacific. If a single spilt drop of oil in the ocean is a violation (just one drop can create a sheen), how can any amount of radioactive water be considered safe? Agricultural chemical runoff is creating 'dead zones,' ocean spaces so depleted in oxygen that marine life cannot exist. The largest dead zone is found at the mouth of the Mississippi River in the Gulf of Mexico and is the size of Connecticut. Marine debris being mistaken for pieces of the missing Malaysian plane made headlines, highlighting the massive issue of pollution in our oceans. The largest debris field is found between Hawaii and San Francisco and contains an estimated three million tons of rubbish. Plastic debris kills more than one hundred thousand sea mammals and one million seabirds every year. Sea temperature rise and acidification is altering the behavior of species, with herrings moving further north to find colder water and oyster farmers in Washington state scrambling to adapt to increasingly acidic waters. The National Climate Report detailed alarming threats to coastal areas from sea level rise. With irreversible Arctic and Antarctic glacial melt, the oceans are predicted to rise four feet over the next few centuries. Despite the problems in and around the ocean, it is paramount to life as we know it and requires our steadfast protection. The sea creates more than half the oxygen we breathe. Over 200 million jobs are associated with the fishing industry. Billions of people rely on fish daily as their primary source of protein. The oceans generate the earth's rain and regulate the climate; put simply, the ocean silently sustains life on earth. We must seize the momentum that is building around the ocean to send a message to our policymakers saying the ocean and the wild animals that call it home need better management. Your voice in this debate is crucial. 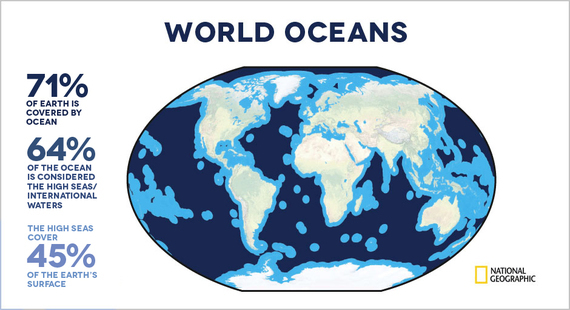 You own 64 percent of the ocean. Or put another way, you own nearly half of the planet! Forty-five percent of the world lies outside of any single country's jurisdiction, forming the Global Commons -- legally recognized under the 1982 United Nations Law of the Sea Convention as belonging to each and every one of us. The history of our commons dates back to Emperor Justinious in 533 AD and the Public Trust Doctrine. This states that certain resources are preserved for public use. The SDG vote at the UN in September could be a game changer. The question is: should the ocean be part of the planetary sustainable roadmap for the next 15 years and be included in the Sustainable Development Goals (SDG's) Sustainable Development Goals. With little media and public attention, the oceans could be ignored. 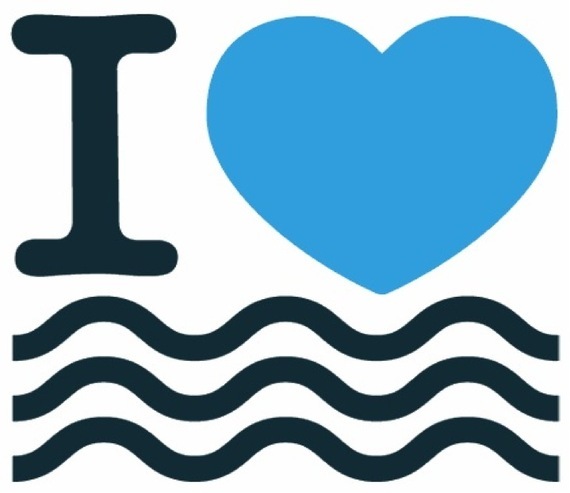 By signing the "I Love the Ocean Pledge" you receive a free digital passport making you a dual citizen of land and sea, sending a message to the UN that you want the ocean to be managed sustainably. Despite its critics, the United Nations is uniquely positioned to reverse the course of destruction of the ocean. When given adequate support, the organization has produced impressive results. In 2000, the United Nations passed the Millennium Development Goals (MDGs), which have proven to be the most successful anti-poverty initiative in history. Bill Gates pointed out, "... the MDGs are the best idea for focusing the world on global poverty that I have ever seen." Understanding the direct connection between a healthy environment and poverty reduction is critical. Poverty cannot be eliminated if people are surrounded by polluted water, toxic air, and ravaged land. With an ocean-specific SDG goal, global attention, billions of dollars and new regulations would create a tidal wave of change around the ocean's problems. For there to be real, effective change, the ocean needs to be looked at as a whole: Fish don't understand boundaries, and neither does pollution. There is no shortage of good ideas about ways to protect the ocean. We know from experience that a moratorium on overexploited fish species can return endangered stocks to healthier levels. Another effective tool to help replenish stocks are marine protected parks. An example of this can be found at Goat Island Bay in New Zealand, where not only have stocks rebounded within the confines of the park, but also outside the protected area. Thanks to Enric Sala and his amazing work on Pristine Reefs we know exactly what a healthy, vibrant reef looks like. Solutions to ocean health and sustainability are well within our grasp. This is an achievable goal, but a major deadline is approaching. Without enough momentum to ensure the oceans become a priority commensurate with their indispensable planetary value, we run a terrible risk. We cannot afford to lose another fifteen years by not including the oceans in the SDGs and making them a central goal. Become part of the growing ocean community and have a say in what happens to our oceans. Take the "I Love the Ocean Pledge." Jacques Cousteau summarized it perfectly when he said, "For most of history, man has had to fight nature to survive; in this century he is beginning to realize that in order to survive he must protect it."